AMD continues its push for affordable computing supremacy. Begone, noisy stock coolers. 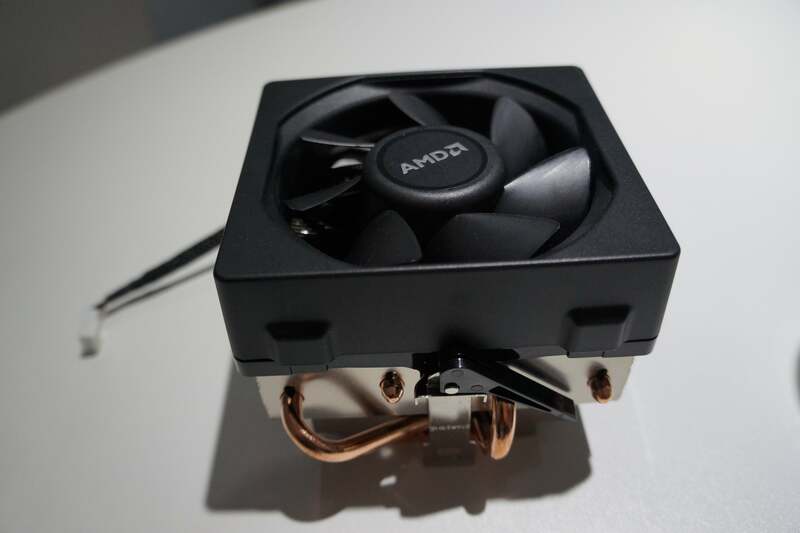 On Tuesday morning, AMD announced that the whisper-quiet new Wraith CPU cooler revealed at CES is now available, albeit only with a single processor. 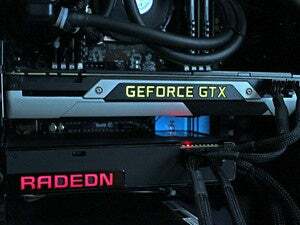 But at the same time, AMD introduced another new “near-silent 95 watt thermal solution” being bundled with six additional chips, including two new ones: a powerful new A10 APU, and a CPU that heralds the debut of AMD’s “Excavator” architecture on the desktop. The 125W Wraith (pictured above and below) is larger than the previous AMD stock cooler, with a larger fan that spins continuously at low speed in order to keep noise levels nice and quiet. 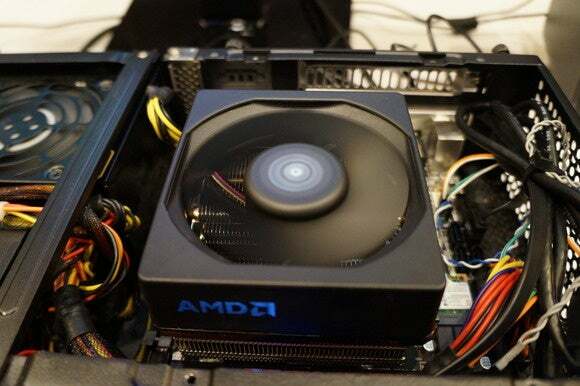 That fan’s enclosed by a sleek black shroud with an illuminated blue AMD logo on the side. AMD says “the new design delivers 34 percent more airflow and 24 percent more surface area for heat dissipation than its predecessor,” which helps keep sound at a mere 39 decibels. I heard Wraith with my own ears at CES, and can report that it’s far quieter than AMD’s older, almost obnoxiously loud stock cooler. 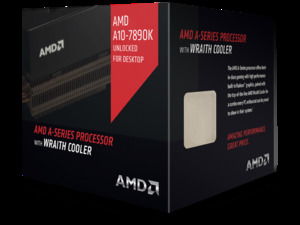 For now, Wraith will only ship with a single AMD processor: the $200 FX-8370, an eight-core, 4GHz CPU. Another look at AMD’s Wraith. Speaking of processors, there are some new ones. First up is the AMD Athlon X4 845, which is the first desktop processor to pack AMD’s more-efficient Excavator CPU architecture. Excavator debuted in AMD’s Carrizo chips for notebooks and while it isn’t anywhere near as potent as AMD promises its forthcoming Zen chips will be, the company says the X4 845 “offers the highest IPC (instructions per clock) AMD x86 performance yet.” And at $70, the price is certainly right. The AMD Athlon X4 845 features four cores clocked at up to 3.8GHz in boost mode, but no onboard graphics capabilities. 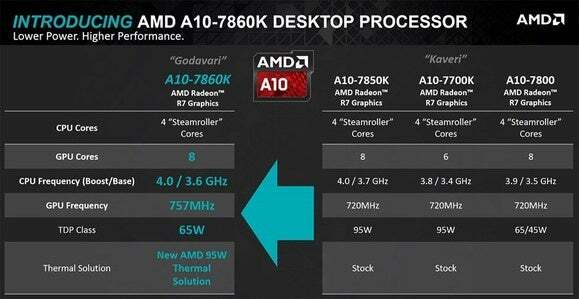 AMD also launched the AMD A10-7860K desktop APU. APUs, or accelerated processor units, is the term AMD uses for chips that combine a traditional CPU with onboard Radeon graphics. In the A10-7860K’s case, the computing’s handled by four CPU cores clocked at up to 4GHz in turbo boost, paired with eight Radeon R7 graphics cores running at 757MHz. AMD’s touting the $117 APU as a solid option for an affordable system designed for e-sports, saying the A10-7860K delivers smooth frame rates in games like Dota 2, League of Legends, and Counter-Strike: Global Offensive. Why this matters: AMD’s new coolers and chips help shore up the company’s reputation for being the prime choice when it comes to affordable computing—a crucial bastion for AMD until the Zen chips arrive. The Wraith cooler delivers huge improvement in noise levels for no extra cost, while the Athlon 845 and A10-7860K focus on delivering solid bang-for-your-buck rather than pushing performance to 11.